First video post ever. Written post resume next week! Word press cut me off before I could finish! This week has been busy and interesting to say the least. With it being the first week back for teachers we have been having 3 days of inservice with plenty of classroom time to set up, it has a been a very productive week for me that way but unfortunately I ended up acquiring an infection at the beginning of the week and was in quite a lot of pain most of those days, don’t worry I’ve been to the doctor but the meds have taken a lot out of me as I sit here and type my eyes are already drooping. My favorite part about this week was going into school on monday and getting all of my budget orders I had placed last year. It truly was like Christmas unwrapping my new portable speaker, movement props and all kinds of brand new music. My big purchase other than my speaker was a plethora of brand new portable microphones from www.bluemic.com . After visiting my good friend Stephanie Sanders at her school last year I got a few great ideas for using mics in some of my classroom projects so I purchase 4 Snowflake mics and 1 Snowball mic for use this coming year. The Blue Snowball will be hooked to the teacher computer: With our future Skype sessions this year better audio will be needed and to record more students performing to share with the community on our class webpages. Netbooks: using different websites and software that allow us to record will give small groups of students opportunity to record various composition projects. Our netbooks are connected to the schools wireless so they can travel anywhere in the school or out on the playground and still be able to record. iPads: I have a few iPads that have a home in my classroom and with the use of the Apple camera connection kit students will be able to take the high quality Snowflake mic and hook it to the iPad so they can record using apps such as Pocket Wavepad and Garageband. These new mics will add a level of professional quality to student projects and provide another experience for students to learn more about proper recording techniques. Build a Recording Studio: I have posted about this idea before in my Recording Studio post where I cleaned out my closet and had students recording their own original compositions in there. It was a great success last year and with the new mics it will add a level of awesome! Recording nature sounds: A great way to help students discover music in everything around them. Using the iPads to record they will have fun finding music in everything they see and hear. Full class performances: Perfect as a carrot to dangle over them for working hard or to record them as part of their reflection process. Recording your classes singing certain songs in just the classroom setting or a full performance has many benefits. Assessment: This is a big one, not really a project but having students in a large class record their voices or play an instrument individually while you take care of the rest of the class will help in creating concrete evidence for the grades you give and make it easier on you to truly hear a student’s progress in a more relaxed setting after the class has left. 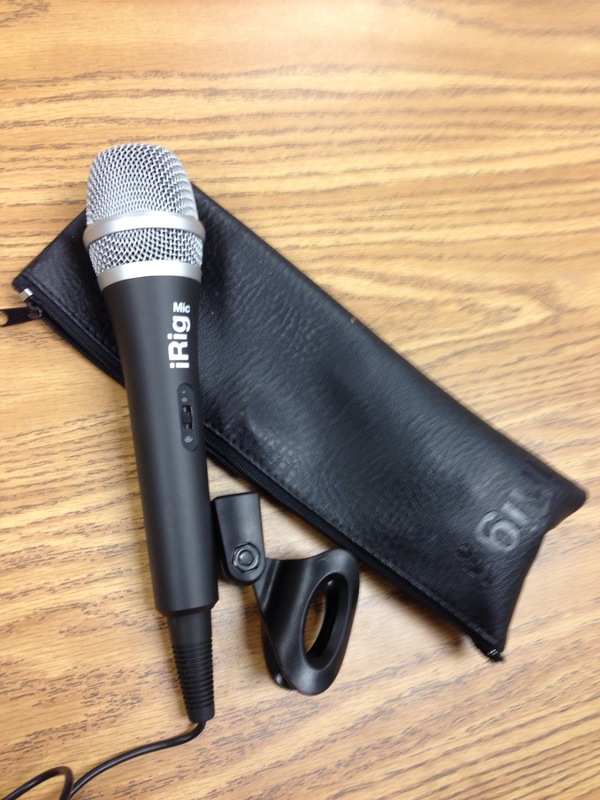 These new microphones are going to be an awesome new tool this year for my students. It adds a new level of tech to my already tech classroom and will help teach students proper use of microphones in recording and performance settings. My lonely iRig Mic has friends now! Did you know I will be talking about recording with elementary students at TI:ME/TMEA 2014 this coming February? If you use microphones for projects in your classrooms how do you do it? What kinds of activities are projects do you use with them? With the new year almost upon me I have been thinking in over drive about how to make the year over the top amazing. I reflected on my sucesses over the past few years and realized Skyping with other classes across the country was something I needed to bring back this year in full force. It allows my students to connect with other students and music professionals across the globe to gain insight as to who else and what else is out there beyond the limits of our city that not many of them have ever crossed. During a Skype connection, students practice proper audience etiquette while listening to the other line. They listen to other students sing or play songs we might necessarily learn in our class and learn about different parts of the world from another students perspective. They also get to perform for someone other than myself or their school and families in an informal setting. While all of this is happening I’m seamlessly integrating technology into my classroom in a meaningful way and giving students an experience they will never forget. 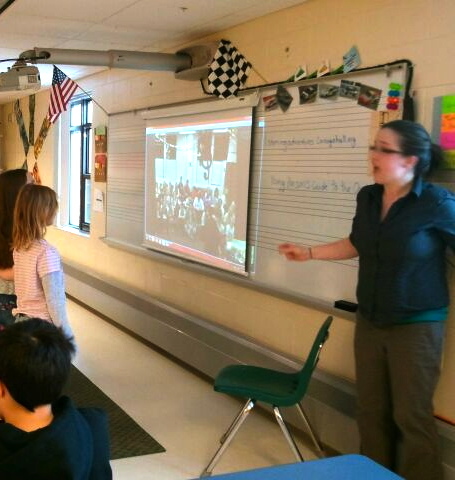 Using Skype for purposes in the elementary music classroom may seem limited at first glance, but being able to just share music with others can provide a vast set of opportunities if you keep an open mind about it. With song shares, skyping in other ensembles to perform with you during concerts, and playing composer pen pals your classes can make music and memories. Finding other people to Skype with can sometimes be a tough time, but when you build up connections through social media such as Twitter and Facebook you get endless possibilities for connections all throughout the year. Putting out a tweet or a post in a Facebook group is the best way to start. Use a hashtag like #musedchat or #edchat on Twitter, post in the Music Teacher Facebook group saying what you are looking for and see what kind of response you get. I’ve Skyped with classes from Illinois to my own state in New Hampshire, and I hope to expand to more places this year. If you are a social media novice and are uncomfortable using Twitter or Facebook, try using: www.education.skype.com a website that connect educators from all over the world for the purpose of finding people to Skype with. Creating a profile and a lesson page will help connect you with other educators and start making those Skype connections. So far for this year I have one song share in October planned, one possible multi-school performance for Jazz month, and a possible ensemble to Skype together with mine for a concert. I hope to have more connections come up during the school year such as music business professionals for my 5th graders, composers, and maybe even a Skype visit from Mr. Quaver , whether it is another class or a music professional to talk to I know it will be a great experience for my students. It’s been quite the interesting few hours after plane delays and cancellations and having to rebook. I have now deemed New England weather the devil and Delta are a bunch of wimps for not being able to fly through a little rain. Oh we’ll though, my first cancelled flight experience was bound to come up sooner or later and as long as I get home at some point before school starts on the 20th I don’t care, due to the fact I am typing this in between flights on my iPad mini my apologies for any links left out, I promise to be better next week. As I finish this blog I’m finally at dinner in my hometown! The program itself is still going to be web based as the kids website and Quaver classrooms currently are but there is talks of many more apps to come for you devote iPad users, this hardworking company is going day and night to make sure Quaver has everything you ever need and their work over the past year truly reflects the many sleepless nights they have gone through for all their Quaver teachers. Looking at the price of the curriculum might seem daunting especially for smaller districts with not a lot of extra funds to adopt such a big program. Take it from me, it is truly worth the price for what you receive, the company hopes with payment plans and the numerous resources included in it that it would be easier for music educators to convince administration to purchase it. 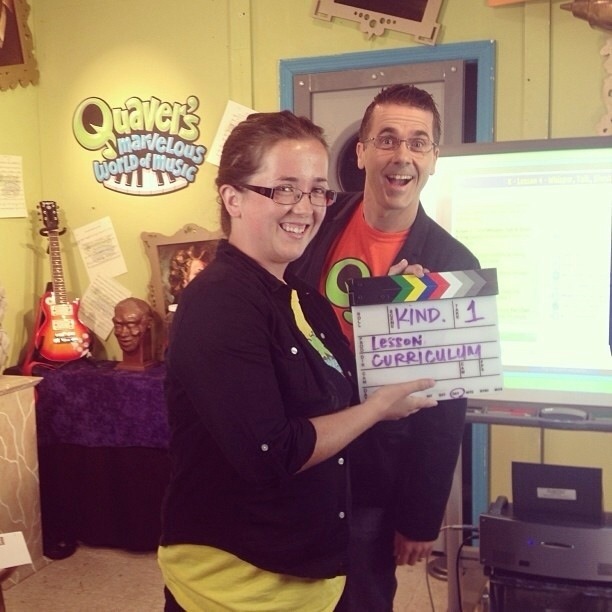 Thank you to the Quaver Team for a wonderful few days in Nashville, I know it is a busy time but being there with you guys was amazing and I’m excited to have another Quavertastic year sharing about Quaver and creating even more creative ideas and activities that teachers can use the program for! I have throughly enjoyed taking a two week break from blogging, I have found myself itching to restart though and glad to be back on a regular schedule! In the two weeks I’ve been offline I have been going low tech in hopes to create a plan B resource for when technology fails, because we all know you will have those times when your WiFi is the only WiFi that goes down in the building in the middle of a lesson on computers! While on Pinterest one day I came across a few pins on the subject of Lapbooks. A lapbook as defined by Wikipedia as: a type of single-subject book created by a student, generally as a supplement to a curriculum. Lapbooks are normally found in a homeschool environment but are becoming more widely used in public schools. 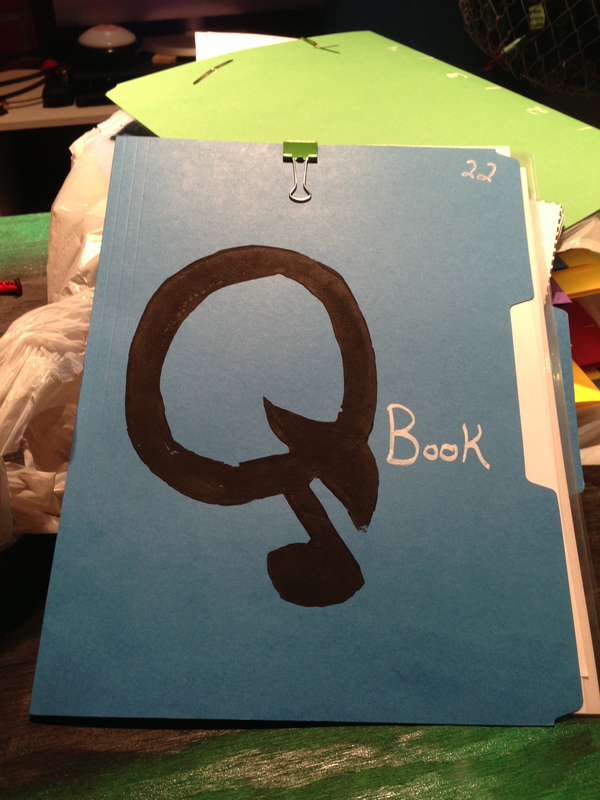 I took this idea and running with the goal of creating a go to low tech resource for my students I created a Q Book. 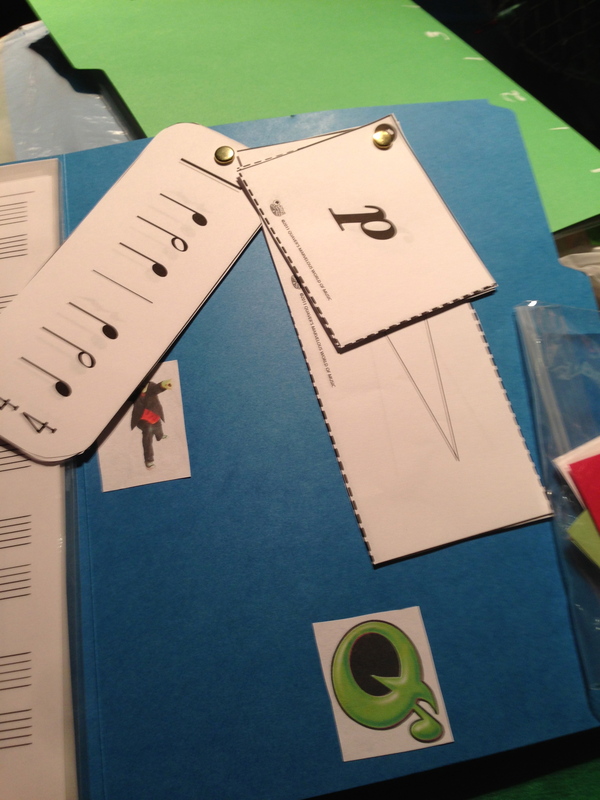 My version of a lapbook that uses mostly resources from www.Quavermusic.com and supplementing some resources from http://www.123homeschool4me.com and my own creations. Why did I call these Q Books? I’m a Quaver Teacher, its how I roll ;-). I have a full class set of 25 of these folders fully created, each with the same resources so every student gets their own. Each folder itself is constructed of heavy card stock and in order to decorate each cover somewhat the same I turned to paint pens and a Quaver Q stamp I made myself out of wood and sticky back foam sheets. Inside each folder is currently 10 different objects the students can use for a variety of activities ranging from flash cards to laminated keyboard practice sheets. 6 of the resources are from the Quaver site, 1 is from 123homeschool4me and 3 I created. The great part about these folders is I can constantly add more to them whenever the need arises! These are the smaller pieces in the folder. 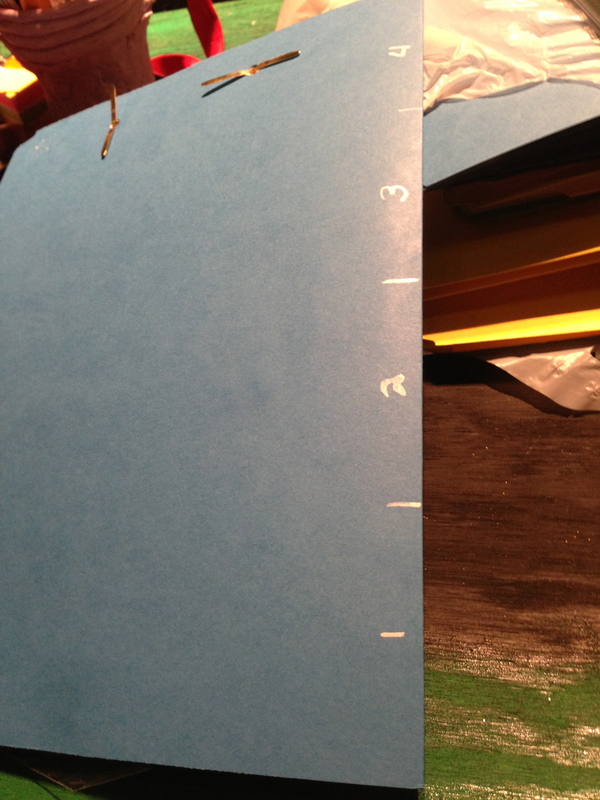 I took a ziploc baggie and stapled it to the folder itself to hold these items. Inside the bag are 2 sets of Solfedge flashcards I made for students to practice with independently or with a partner. They could make patterns or just show each other a card and have an Orff instrument in front of them to test the pitch. I also have laminated red and green cards for students to put out to show me if they are good to go and are green or if they need assistance so they put out the red. 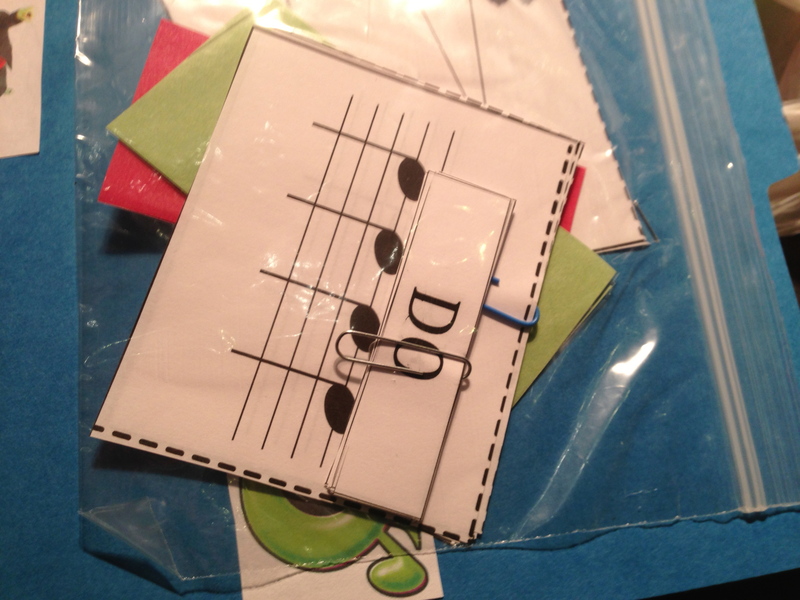 Last, I have a set of rhythm flashcards found in the Quaver Duration classroom for students to practice composing and reading rhythms. The next 2 things are two different flashcards that I hole punched together and using a brad, attached to the folder itself. The first set is another set of rhythm cards from the 123homeschool4me site for students to practice saying longer rhythms and maybe to start them into rhythmic notation where I would clap/play a rhythm and they would have to show the correct one on the set to me. (Assessment! Yay!) The second set is from the Quaver Dynamics classroom. I teach dynamic symbols in my upper grades and I thought these would be killer for a listening activity and mapping dynamics on a longer piece. What CAN’T you use a laminated piece of staff paper for? I’m still looking for the right dry erase markers to include in these folders but every student having this in front of them is going to be so helpful when talking about composition and allowing them to practice the basics themselves while we are talking about it. 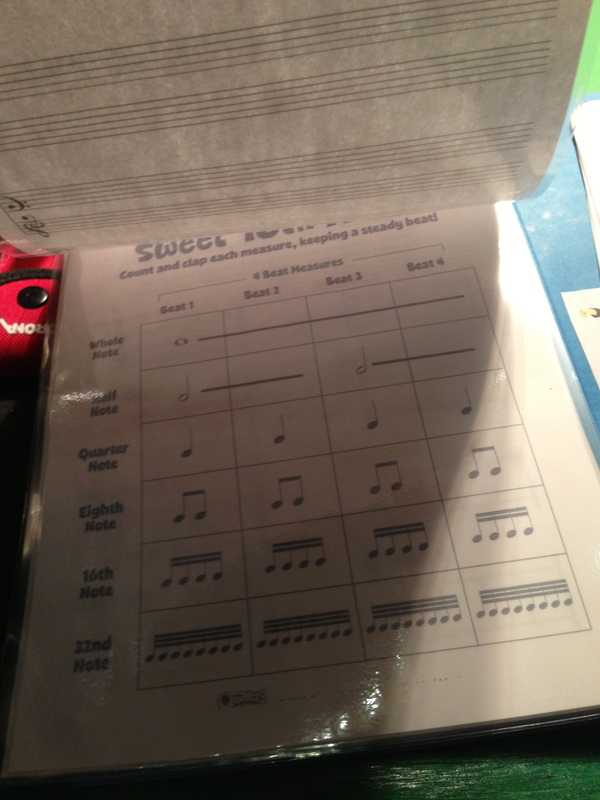 This is the Sweet 16th Note worksheet from the Quaver Duration Classroom. I talk about how a note is divided all the time. Every time I have this discussion in my room I can see some lightbulbs appear over some heads. I liked this visual and had to include it. 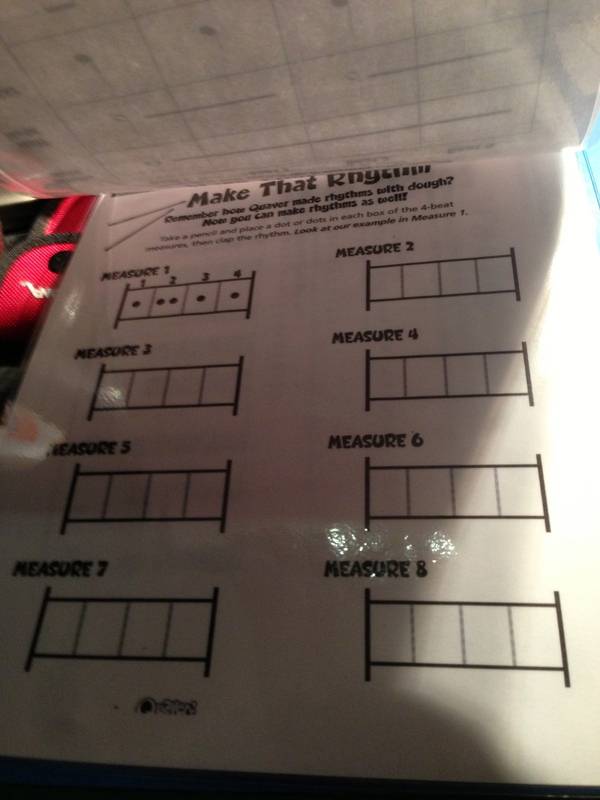 This is the Make That Rhythm worksheet from the Quaver Rhythm Classroom. This is laminated for lots of practice. When I start talking about making rhythms with my students I use dots instead of notes. I find they grasp the concept better because they only have to worry about the dots and not the note names. 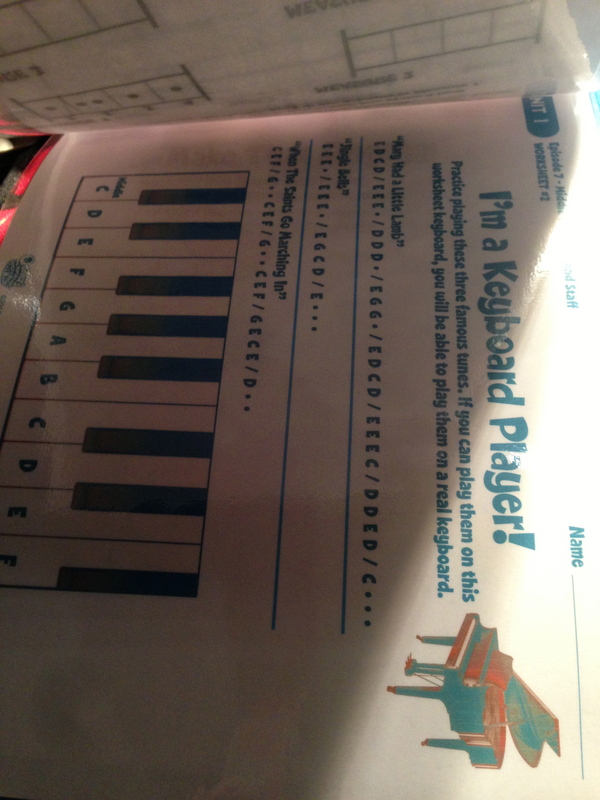 I’m a Keyboard Player worksheet from the Quaver Middle C and GrandStaff Classroom! My students are constantly asking for piano lessons but I only have 1 piano! I felt this could be a great independent filler activity and fantastic practice so they can bring a song right to the piano. I got very much into using Solfedge signs with all my grades this past year. Including this was a big must. It will be great for practice. This is the back of the folder! Remember those flash cards? 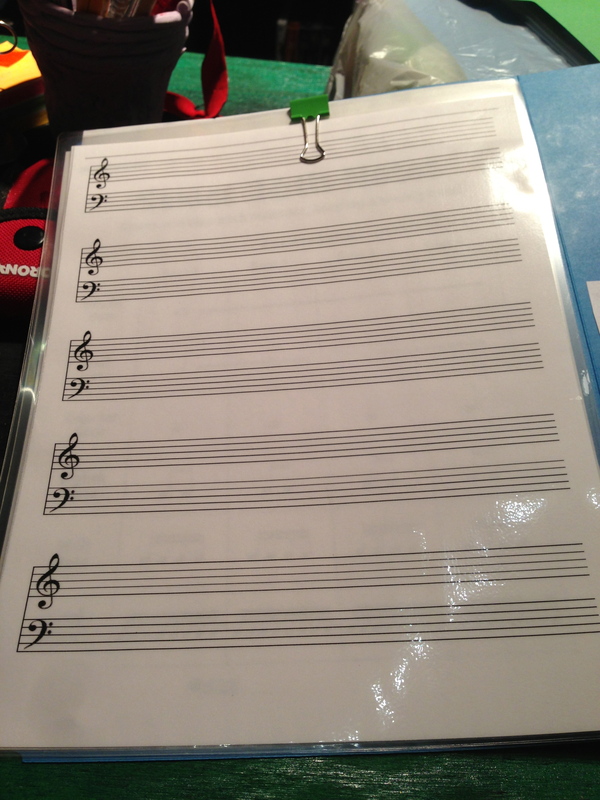 I drew a measure ruler for students to use when composing with those cards! A 4 measure rhythm? Yes please! So that is my brand new low tech resource I am so proud of. I hope to come up with more things to add to them during the school year as the need arises, right now all that is missing from these are dry erase markers and possibly a magazine rack to store all of them in. I’m sure you’re probably thinking now, so when are those links coming? I want to print these out and try it! 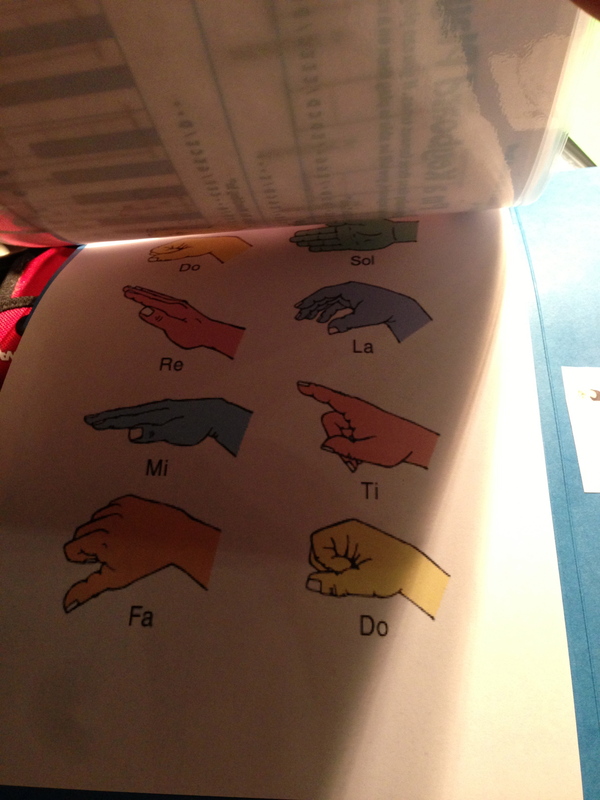 Well, 123homeschool4me.com has a GREAT lapbook resource for music so you can grab those duration cards. Have a Quaver music account? Go and grab them! You need to purchase the Quaver Classrooms mentioned in this post in order to use the printables. Email info@quavermusic.com for more info on them! What would you add to these books? Share your ideas! I’m looking for more to include in these Q Books!